If you are an Android user then it might be possible that a question of how to record a video of your screen arise in your mind. This option of recording phone screen is there in iOS11 but Android users are still waiting for this option. The Android is still missing this feature. Screen recording option is necessary when you want to record a tutorial on mobile devices. Many gamers record their gameplay and share the videos with their friends or upload them to Youtube. Therefore, this is a very important feature for some Android users. Some mobile phone’s manufacturers have added screen recording option in their custom ROM, but many devices still lack this notable feature. For your information, Xiaomi’s MIUI has a good built-in screen recording option. So, if you are Xiaomi users, no need to worry about this problem. 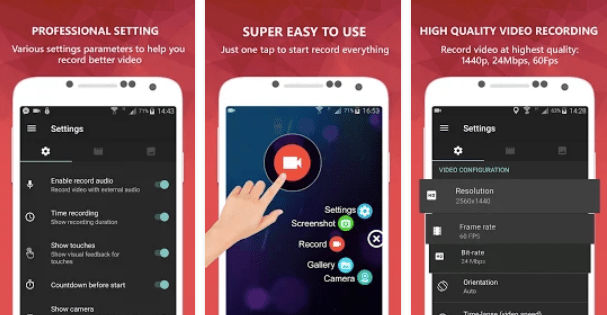 There are many third-party screen Recording Apps for Android that you can use if your smartphone lacks this feature. I have made the list of best and free screen video recorder with audio. You can use any of them to record the phone screen on Android devices. Below is the list of best screen recorders for Android that you can use to record a video of your screen with audio. This app is my personal favorite. I am using this app for last 1 year and found it very interesting. It is a totally free mobile screen recording app for your Android smartphone. It also has no recording limit and it does not show any ads. This is the reason, I prefer to add this screen recorder app on the top of the list. DU Recorder supports the resolution from 240p to 1080p, frame rate from 15 FPS to 60 FPS and even bit rate from 1 Mbps to 12 Mbps. It has many features like Pause/resume screen recording, Enable front camera (facecam), Record external sound and lot more. 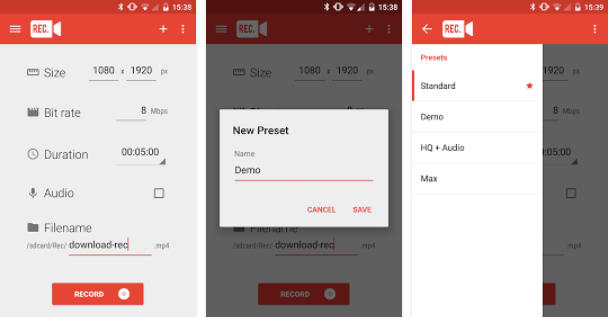 The AZ screen recorder app is another app that can record Android mobile screen. It doesn’t require root access. It has no time limit and no watermark. This screen recorder is very easy to use with one action to start and stop recording. The app also gives an option to make a time-lapse video of your screen. It offers options from 1/3rd speed to 3x speed for videos. 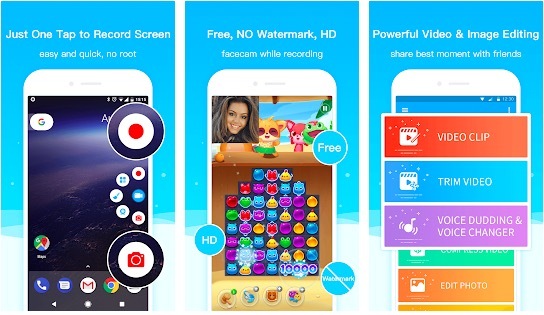 This app can access front camera to record your facial expression with the mobile screen. You can emphasize, draw a symbol or mark something with any chosen color directly on your screen. The app is free to use but it supports ads. Screen Recorder is an app help you easily record screen. It supports front camera while recording the screen. This app has inbuilt video editor which helps you to trim or edit your video after recording. You can also add text or image to your recording. This screen recorder helps you in recording videos with the resolution from 240p to 1080p. You can select frame rate from 24 FPS to 60 FPS and bitrate from 2 Mbps to 15 Mbps. There is also an option to launch the game and record your gameplay. This app is free to use with ads in it. This is also an excellent screen recorder app for Android. The app is free and it doesn’t require root for working. The app also doesn’t put any watermark on recorded videos and there is no time limit for recording. It can record 1080P at 60fps and also supports lower resolutions at different frame rates. You can also pause or resume the recording through a floating window or notification bar. It also features a shake option to stop recording. If your phone has external storage, you can also save the recording directly on external storage. 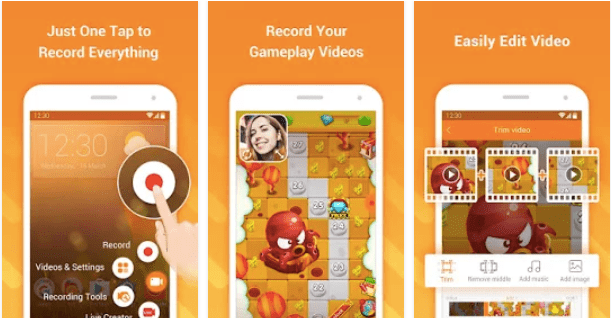 The app also has a built-in video editor where you can cut a part of the recorded video or trim the video. You can also merge videos and even add background music if you want. Rec is also one of good recording app for Android. It is similar to above apps with flexible and fully configurable screen recording capabilities. You can record audio up to 1hr. The devices running on Android 4.4 requires root. 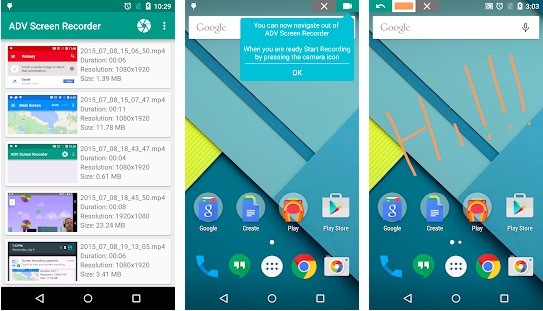 For higher Android versions, it does not require root. You can also use an external mic for audio recording. To stop your recording early, you can shake your device, or switch your screen off. 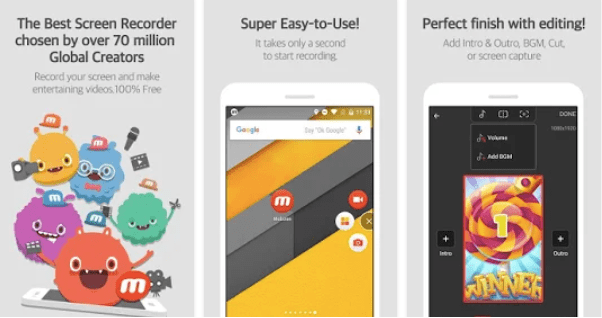 With Mobizen, you can record FULL HD videos. You can record your reactions while recording game sound and your voice with Facecam. It has a variety of Video Editing Features to enhance your recording. The app also has touch gestures. By default, this Screen Recorder for Android comes with a watermark enabled option. But you can remove the watermark from the settings for free. ADV Screen Recorder is also a good Android screen recorder app. It is an easy to use app that doesn’t ask you to root the phone. It also has all those features you look for in a screen recorder app. You can pause recording, draw on the fly, use the front or back camera while recording and also set text on the video. It also has an option to trim the video in case you need. You can also set different video resolution, bit rates, and frame rates as per your need. It also doesn’t add any watermark on your recordings. All these free screen video recorders with audio are best in their respective way. If you ask me which one to use, I will suggest you download DU screen recorder app or AZ screen recorder app for Android. You can also record your voice and your face with these screen recorder audio and video for free. Do share your experiences with us after using any of these screen recorders for Android from this list.